If you're looking to make a paper doll, you might like to find a paper doll template, instead of going the complete DIY route. Here is a guide to templates you can print out for free or buy for cheap. Paper Puppet Palooza by Norma Toraya. If you're looking for more complex paper dolls, e.g. with moving parts, this is a wonderful resource. Features templates, ideas, inspiration and more. I highly recommend this book. Dover Paper Dolls are cheap and have diverse subject matters, from fairies to Russian Folk costumes. Some, though not all, of their paper dolls wear underwear, giving you a decent paper doll template. New Attitude: An Adult Paper Doll Book is a...strange...book, but not necessarily in a bad way. It features "swinging singles and socialites." Funny but somewhat impractical. Here are some printable paper dolls. If you're looking for flash games, scroll down. Rushita's Sailor Moon Paper Dolls. Medium-resolution scans of Sailor Moon paper dolls. Even if you're not into the series, it's very easy to alter one to make it more generic, or more like you. 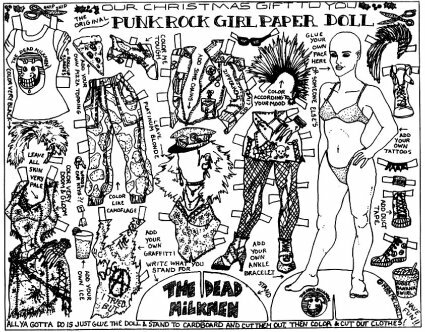 The Dead Milkmen's Punk Rock paper doll template. A Quick Google Image search. Return to Enjoy Your Style's books page.